There is no denying that AMD has made a name for themselves after releasing the 2nd generation of Ryzen processors. We already know that the first generation was a massive success but it was missing some basics. So, AMD decided to release the 2nd generation and made it much, much better than it was before. Keeping up with AMD, the add-in board partners started releasing some amazing motherboards that were based on the X470 chipset, and in no time, we had a long list of motherboards that you could readily buy. If you are in the market looking to build a performance-oriented AMD gaming or productivity PC, you will have to choose from the sea of motherboards available in the market. These motherboards are there to make your experience all the easier and more convenient. But since there are so many motherboards available in the market, we decided to pick the 5 best X470 motherboards that you can buy right now and start building your PC. Now, these motherboards were picked on various different criteria as well as expert opinion because we wanted to make sure that we are covering something for everyone. Let’s have a look at these options. The first one on the list is the ASRock X470 Taichi, a motherboard that does not require any introduction and neither does the company. For the longest time, ASRock has given us some amazing components and they are continuing to do so. 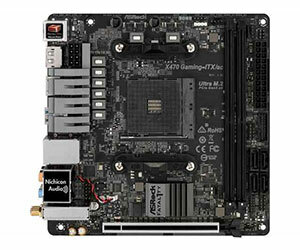 The Taichi is no different as it happens to be the higher end ASRock motherboard. How good is it? Well, let’s find out. To start with the good things, the motherboard gives a great performance when it comes to overclocking, memory, as well as storage. Whether you are building a high-end gaming PC or a media machine, the motherboard should be more than enough. You have an ample amount of storage options available onboard as well, so there is no issue whatsoever. I love the design language ASRock has decided to go with. It is one of the best looking motherboards available in the market. The overall specifications are on par with the best motherboards available in the market. So, rest assured, there are no stones left unturned. As far as the downsides are concerned, I am happy to report that there is nothing holding this motherboard back as far as the technicalities are concerned. Everything is up to the mark, and it works wonderfully without any issues whatsoever. However, I would like to point out that the motherboard is slightly more expensive than the rest of the options available in the market, but it should not be an issue since it more than justifies the price it carries. Overall, the ASRock Taichi is one hell of a powerhouse that delivers amazing performance, and the best part is that the motherboard looks amazing while doing so. Excellent performance in terms of memory, storage, and stability. Can allow you to overclock the processor with ease. Packed with all the advanced features of a modern motherboard. Asus is one of the companies that do not require any introduction. All thanks to their amazing components that have been gracing us for years now. They are known for their rock solid consistency, and performance. Today, we review the Asus ROG Crosshair VII Hero WiFi. One of the best motherboards that you can for overclocking, or simply because you love how Asus is handling things in their ROG lineup. Looking at the good things first, the Crosshair VII Hero is one of the best looking motherboards that you can right now. It looks great with its LED lights and neutral color scheme. Achieving this scheme is not an easy job but Asus has done it fantastically. The motherboard offers a slew of connectivity options and makes sure that there is no port missing whatsoever. You can pretty much connect whatever device you want right out of the box. 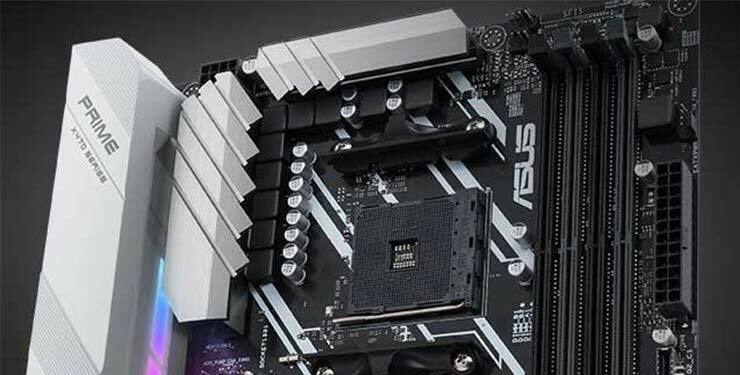 The motherboard offers great overclocking and an even better bios implementation for those who are looking for the smooth and consistent experience Asus is known for. The only issue here is that the motherboard is on the slightly expensive side. That is partly because of the ROG branding but additionally, the motherboard is also known for justifying the price by offering stellar, stable, and consistent overclocking performance. In conclusion, the one thing that I am certain about when it comes to the Asus ROG Crosshair VII Hero WiFi is it definitely happens to be one of the best motherboards available in the market. It gets the job done in pretty much every regard and should give you any issues whatsoever. Plenty of connectors for all types of devices. One of the best bios. Slightly more expensive than the competition but justifies the price tag as well. MSI is great when it comes to churning out some great products that follow the legendary consistency the company is known for. Ever since they started the gaming line up of motherboards, they are only making things more and more accessible for the general public who does not want to spend a lot of money on a motherboard. Today, we look at the MSI X470 Gaming Plus motherboard; a budget-oriented motherboard that comes with all the signature MSI features to make sure that even if you are saving money, you are still getting the top features. The good thing about this motherboard is that it is perhaps one of the most affordable options available. But do not let the cheap price fool you as, despite the price, it still gives you a stellar performance. Something that you do not get a lot from different motherboards in the market. Additionally, the good thing is that when it comes to overclocking, the motherboard does well, and the looks are good too. However, there are a few downsides. For starters, the LED lighting is just average at best. The motherboard does not come with the support for USB Type C, there are no M.2 heatsinks, and the LAN port does not have Intel drivers. 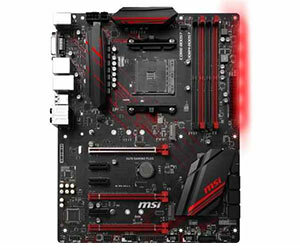 Overall, the MSI X470 Gaming Plus motherboard is definitely good, however, there are some minor issues that can be a problem for some but the good news is that they are not going to ruin your overall experience of gaming at all. Easy to use bios and software. The LED lighting does not look as good. The motherboard does not come with a USB 3.1 Type C port. There are no heatsinks on the M.2 slots. The LAN is not powered by Intel. 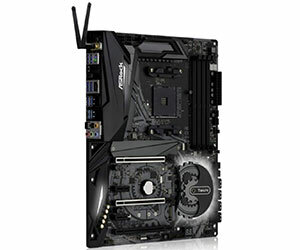 ASRock is back with another great motherboard on the list, however, this time, things are a bit different than before. This time, instead of going with the traditional, ATX sized motherboard, we are shifting things around, and looking at an ITX motherboard that comes with just the right amount of features to make your overall experience great. What is so great about the ASRock X470 Gaming ITX/AC that earned it a spot in our list? That is exactly what we are going to look out for. For starters, one of the best things about this motherboard is that it offers great value for money. ITX motherboards are usually slightly more expensive than other options but this one keeps it simple by providing excellent value as well. So, you are really not losing a lot here. The motherboard also has impressive transfer speeds on the M.2 slots of 32 Gigabits per second, and the overall performance of the motherboard is pretty solid and consistent throughout the entire tenure. The overclocking on this motherboard is also an impressive feature, so you are definitely getting a lot of good out of it in all sorts of ways. As far as the downsides, the overall list of features is a lot similar to the features that you would find in an X370 chipset. The CPU VRM design is not the best and can cause some instabilities at higher clock speeds. You do not have dual M.2 slots or heatsinks on the slot available. Overall, the ASRock X470 Gaming ITX/AC is an impressive package that comes at a rather impressive price as well. If you are looking for an ITX motherboard, I don’t think you can get a better offer than this one. CPU VRM design is not the best. The chipset is a bit similar to the X370. The last motherboard on our list is from none other than Gigabyte. Now the thing about them is that we are all familiar with their motherboards, and other components, and we are also aware of the fact that they have released some impressive components over the past couple of years. 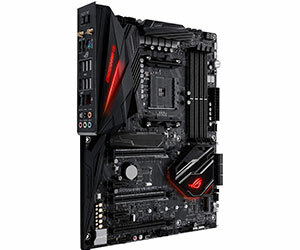 The motherboard in question is the Gigabyte X470 Aorus Ultra Gaming, one of the best entry-level X470 motherboards that you can buy, but one that actually comes with some pretty good set of features that will certainly satisfy those who are looking to spend less money, and get a lot of benefits. One of the main selling points of this motherboard is that it is priced competitively. You do not have to worry about spending a lot of money on this motherboard because it does not cost a lot of money. The layout is impressive, and if you want good looks, the motherboard certainly has those. Despite being cheap, the motherboard offers decent overclocking, and the audio performance is among the best we could have hoped for. Sadly, the motherboard does not have the amazing RGB lighting, the cooling on the M.2 is not as good, and if you are looking for extensive SATA support, you are not going to get that either. However, these minor issues do not hold the motherboard back in any sense. As a matter of fact, the Gigabyte X470 Aorus Ultra Gaming remains an amazing motherboard should serve you well under any and all circumstances, and give consistent, and solid performance through and through. Great performance even with a lower price. The overclocking remains rather decent. Lack of extensive SATA support. 2 cooling is not the best. For anyone who is looking for a good motherboard for their new X470 system, the good news is that the market will have so many options to choose from that it will make your entire experience easy. 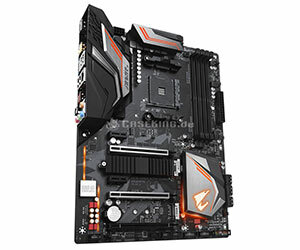 However, finding the right motherboard can be a difficult process, and more often than not, it leads to confusions that most people do not really want to go through. That is why, in this roundup, we have looked at the best X470 motherboards available in the market. The good news is that all these motherboards have been tested properly, and they are readily available as well. So, for anyone who is looking to build an X470 system, and wants to go and buy the best possible motherboard available in the market. This is the definitive list that will allow you to pick the right option and go with it.